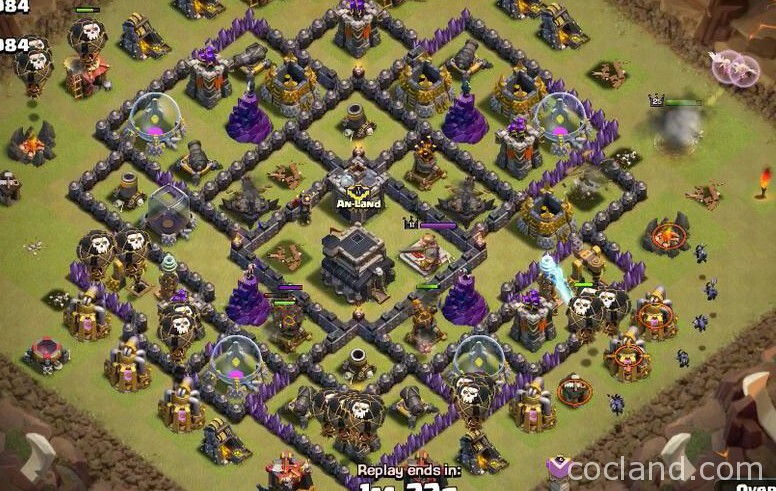 Hey guys today I want to introduce to you guys a new 3 star TH9 war strategy. I call it the LightningLaLoon attack. 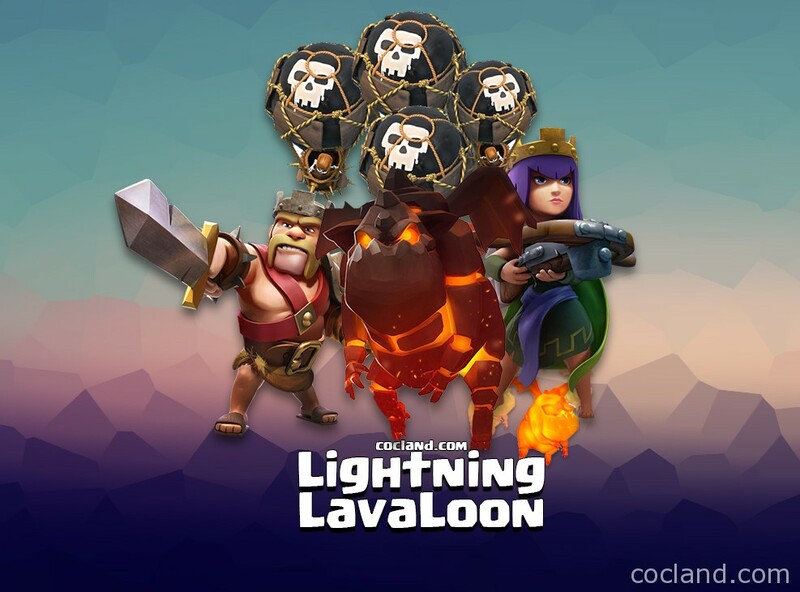 You guys may have seen similar 3 star Lavaloon attack strategies with the Lightning Spell, but the strategy I’m going to share today is much different. It’s a very solid 3 star attack strategy that doesn’t need a kill squad! You don’t need a kill squad like every other solid TH9 3 star attacks. I know what you’re thinking, how can you 3 star with Lavaloon if you don’t lure and kill the Archer Queen and Clan Castle Dragon? Well the strategy I’m going to share removes both key threats right from the start. So when I said that you can use this strategy to kill the Clan Castle troops and the Archer Queen and an Air Defense all at once to start the raid, you might ask how is that possible when 4 Lightning Spells will not destroy the Clan Castle. Well allow me to demonstrate in this first attack. I have 3 very recent attacks against maxed TH9s to share in this guide. How did I come up with this strategy? Now you’re probably thinking that it has to do with using 4 Lightning Spells to destroy the Clan Castle and Archer Queen like the commonly used attack at TH10 to remove Clan Castle, Archer Queen, and an Inferno Tower. I asked myself if TH10s were able to 3 star other TH10s with this strategy, then what’s stopping TH9s? Well the problem with this strategy against TH9s is that TH9s can only use a maximum of 4 Lightning Spells, which is not enough to destroy the Clan Castle. And the main Clan Castle threat to Lavaloon is a Dragon. Then a light bulb appeared over my head and I thought of how the new Poison Spell powers up exponentially and severely weakens a Clan Castle Dragon. However, a level 3 Poison Spell is not going to kill a Lv5 Dragon. So I thought about how in the old days we would use the Lightning Spell to kill both the Clan Castle troops and an Air Defense. So I thought, why not lure the Clan Castle, pull the Dragon next to the Archer Queen and an Air Defense and drop both the Poison Spell and Lightning Spells on them and remove 3 big threats all at once. And the first time I tried it, it worked! However, the main challenge was that even with the Clan Castle, Archer Queen, and an Air Defense taken out, it’s still a challenge for LavaLoon to 3 star alone without spells. But then I thought of how overpowering the Archer Queen with Healers is against TH9s, and it would fit perfectly with this strategy because you can have your Queen walking around the other side of the base destroying and clearing up defense, making it easier for LavaLoon to easily clear up the rest. Since you didn’t waste your Heroes as a kill squad, you have the luxury of using them to deal a large amount of damage to the base. You can use your Barbarian King to shield for both the Archer Queen and Balloons from defenses. 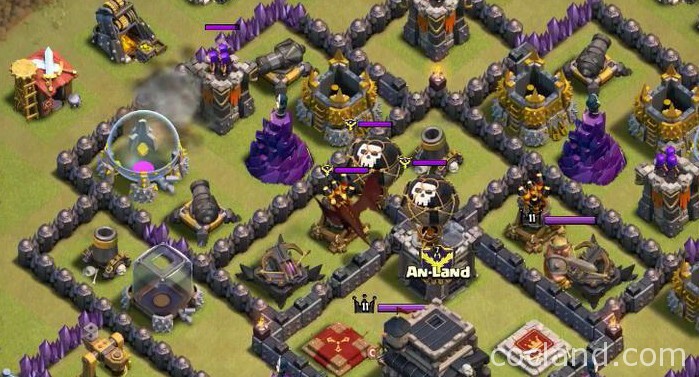 The best part about this attack is, it’s excellent against the common anti-3 star bases that heavily protect their Archer Queen. Well that’s my short story on how discovered this strategy. Now I’m going to teach you how you can use it to easily 3 star a TH9 base and show you how I used it to get 6 stars in the last war with it. The first step is to trigger the Clan Castle and pull out the troops in there. There are many ways to trigger a Clan Castle. Most of the time you can simply use Hog Riders to do so. So here I pulled out the Dragon and 2 Balloons with 2 Hog Riders. 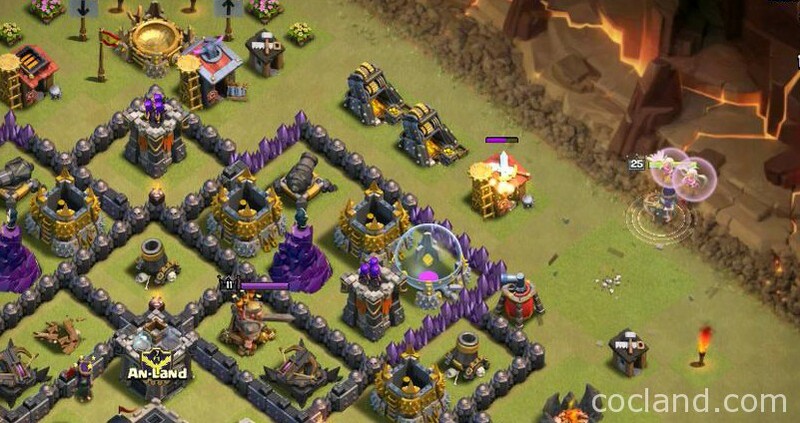 Next, you need to position the Dragon next to the Air Defense and where Archer Queen will walk to. Basically where you want to drop all 4 of Lightning Spells and the Poison Spell. To correctly position the Dragon, you need to pull it will Archers on the outside of the base. In this raid, the Dragon is already flying on top of the Air Defense, so I don’t have to move it in this raid, but I’ll show you how the Archer-pull is done in the second raid. Next, you want to place your Poison Spell on the Dragon and rapidly drop your Lightning Spells on the Archer Queen, along with the Air Defense and Dragon in range to knock everything out. You must do this precisely. The Archer Queen’s movement is predictable. What I mean by that is that she makes the same movements by walking clockwise every time. So when you’re scouting the base and planning your attack, you should plan out the exact moment to drop the Lightning Spells on the Archer Queen along with the Air Defense and Dragon. Also, keep in mind that you can view the position of the Dragon by its shadow on the ground. To deal the most damage damage on the Dragon, you must drop your Lightning Spells as close as possible to that shadow. Also, you need to rapidly drop all 4 Lightning Spells at once. Keep in mind that the Archer Queen is always moving every 2 seconds. With three huge threats gone, you can now use your Archer Queen with your Healers on the backside for her to clear up those backside defenses. Step 5 – Deploy your Lava Hounds and Balloons, don’t delay! One thing to keep in mind that this attack isn’t very time-friendly. You’re only given 3 minutes, so you need to use your time wisely. But that’s not so hard to do with this attack because you’ve already used up your spells. While you have your Archer Queen and Healers placed on the backside, you should immediately deploy your Lava Hounds and Balloons. Spread your Lava Hounds as much as you can to not only shield your Balloons but also possibly trigger red Air Bombs so they don’t harm your Balloons. You want to deploy 2 or 3 Balloons per defense while your Balloons are shielded. Proper deployment of Balloons is very important. 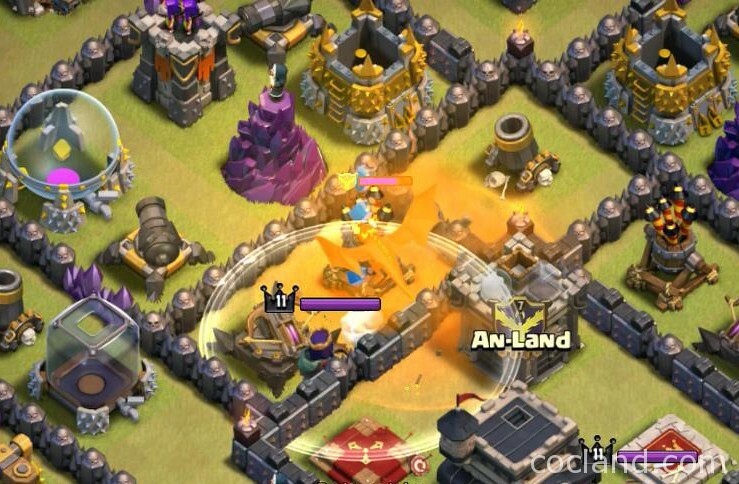 With your Lava Hounds and Balloons deployed, you can put your focus back on your Archer Queen. With Balloons deployed, you should deploy your Minions right behind them to where you want your Archer Queen to be funneled. Here I sent out my Minions to remove these structures so instead of my Archer Queen being pulled down by them, she can focus on moving up north to remove the defensive threats on the back. Another thing to keep in mind is that even when you’ve removed the key threats to Lavaloon, it will still be difficult to fully destroy a maxed TH9 base with just Lavaloon and without Rage or Haste Spells. So you must use your Heroes to clean up the backside. The Barbarian King is excellent at tanking. So you can use him to shield both your Archer Queen and your Balloons, and here you can see that I used my King to shield the Queen as she removes the defensive threats over the walls. I didn’t even have to use her ability against this maxed out base. Make sure to watch my video. I have 3 very good examples of this attack! As well as how to counteract a Lava Hound in the CC. Well that will be all of this new attack strategy that I really wanted to share with you guys. I’ve been having lots of success 3 starring with it. And it’s excellent against those really tough to lure anti-3 star bases that are very anti-GoLavaLoon. This is a great alternative to 3 starring those bases. So if you enjoyed this video, be sure to definitely subscribe because I’m gonna have a lot more great content for wars. Also definitely share this with your clan mates so you guys can learn a very effective way of 3 starring and winning wars. Oh and I’m recruiting experienced war players for my war clan, Altar of War. We’re mainly looking for TH8 and TH9 players who can consistently 3 star their equal. We already have a bunch of TH10 players with lv40 Heroes. So if you’re looking for a great war clan, come join us.